Photomadic - Social Media Photo Booth Explainer Video from Ty Williams on Vimeo. Relatively new company Photomadic have made the iPad an integral part of their all digital, mobile photobooth. With an iPad occupying two sides, there is a larger touchscreen on another side which is used to set up the shoot and select options. The fourth side is taken up by the camera lens and ring flash, after all, photography is all about the light. The iPads feature a custom app allowing sharing via Facebook, Twitter or e-mail, with secure log out promised when the user is done sharing. Customers can completely customise the branding/styling of shared images and, of course, you can order prints on paper or a range of other novelty items like keyrings, etc. We think it is a really fun idea and a clever re-imagining of the old photobooth experience using touchscreen technology. It Looks Like Rain from MacPhun on Vimeo. This short film was shot and edited entirely on iOS app Vintagio (formerly Silent Film Director) by MacPhun. We think it is a lot of fun and hope it brightens up your Friday morning. The movie itself has a great little story and it is a fantastic reminder of the computing power we now carry in our pockets. Some great editing really makes this movie snap too, we hope you enjoy it. Here is a chance for everyone to get creative, be part of an International Art Project, and possibly have your art featured in a new app. Whether you are aged 3 or 103 (note: there are no age limits), can't draw for toffee (like one of the iPC team) or can sculpt a digital masterpiece that makes everyone jealous, you are encouraged to submit your Tree to the Dancing in the Digital Forest project. Organised by digital artist and educator Paul Kercal from Guildford College, Dancing in the Digital Forest is an art project that will encourage participating school-age and FE students to draw their own trees or colour in trees submitted by you and other contributors. The resulting 'Forest' will be a collection of all the Trees submitted plus the students' creations, displayed in a 50m2 space at London's ExCel exhibition centre from 5 - 8 October 2011. By submitting your Tree picture you could also have it included a Digital Forest app! All we need from you is a tree: can be colour, black and white, abstract, realistic, sketched on paper, painted on iPad, up to you. A tree which you are happy for the college to add to the app and the picture. Any Parent, Uncle, Auntie or Grandparent will know that keeping young children entertained is a full-time job. Fortunately for us then the iPad, with its bright colourful screen and touch interface, attracts Children like bees round a honey pot (not always a good thing of course). Already well versed in creating brilliant apps to entertain little ones, Portegno Apps has brought out a new iPad only app KidsMag. This monthly book-style app includes lots of educational based activities led by Brother and Sister characters, Teo and Bianca. The activities echo the kind that you would get in paper magazines, you know, the ones the kids nag you to buy every time you visit a shop. The price is about the same, or even less, than the 'analogue' version. The iPad Creative kids like this app a lot. As the app has an educational bent to it some of the commentary is a little long for kids impatient to see everything but most of the activities really captured their imagination. Things like dressing up the Fire Fighter characters and for my three year old Son the Fire Engine noises. My just-turned-Six Daughter enjoyed the 'spot the difference' and 'find the things that don't belong' style activities. The Farm activities are fun and the animal noises made the kids chuckle too. There is even a musical caterpillar page called 'Springtime Music Maker', that has a xylophone type of sound board plus some drums and bass guitar concealed around the picture, that the kids loved finding out about. They liked the narrated stories too. These pop up the words so your kids can read along. The writing and narration are clear and very well pitched for the age group. You can access different versions of a lot of the activities by shaking the iPad (gently! ), for example the 'match the shape' puzzles can be changed for a new set of puzzle pieces, and the kids had their favourites they wanted to use. Overall they were thoroughly entertained by KidsMag and they will no doubt be asking for it again when they get their iPad ration later today. There are three pages at the end of the magazine that are designed to help your kids learn Spanish, by naming parts of a house, learning some Spanish verbs and Spanish words for things seen in this issue of the magazine. This is a nice teaching technique providing relevance and context, especially on repeated viewings, "What's that in Spanish?". Whilst the Spanish language is not taught very much at school here in the UK, it is still nice for children to start learning another language at a young age. In the UK children are more often taught German and French at school, but with programmes like Dora the Explorer being shown on kids' TV, Spanish is becoming more common and personally, it is preferable as it can be more useful. We found that the kids seem to be more willing to play with the iPad app and spend longer doing so than with the paper magazines we buy them. These paper versions can cost anything up to £3.50 (~$5.70) each and we have to buy two of them to stop fighting! KidsMag cost us just £1.79 ($2.99). The website does say $3.99 so the price may increase, but even so, the quality of narration, voice acting, animation and range of activities, easily makes up for that price. Plus the entertainment value of using 'Daddy's iPad' means the kids can't argue over who owns the magazine because it is not theirs to fight over. We just need to referee the iPad session! Portegno's publishing model interests us too. It is not a monthly subscription model but, like other magazines, they plan to make this a monthly issue, so it will be interesting to see how the sales go after the first issueand importantly if they can deliver fresh, new and entertaining content month after month. In our experience kids will drop something like this as soon as they get bored, so it is a tough job they have on their hands. The next issue looks like fun though, with a Space theme and more Spanish learning so we'll see. Advertising in a paid app? We were disappointed to see 2 whole page ads for other Portenago apps in the mag. As much as we like their apps, having paid already for this app we don't like having to scroll past an ad page quickly before a little finger jabs the app store button, which they always seem to find. We could be being a bit harsh here, it is not offensive, there is even some interactivity built-in to the ads, such as the 'iWash My Dogs' page shown below where you can click on each of the 4 washing stages and see the cartoon dog change. But because the add pages look just like one of the magazine pages, skipping past them upsets the kids as they think they are missing out on something and that just annoyed us to be honest. This might not bother you at all but we thought we should mention it just in case. It's a small annoyance really, taken on balance we still think KidsMag is a great app. If you have little ones to entertain, especially around 5 years old and under, we think KidsMag is well worth the money. It is packed with bright, colourful and fun activities that include good educational value. Kids will keep coming back to the activities to explore all the different variations and we think you will easily get a great deal of entertainment value out of this app. The first edition of KidsMag is available in the app store now. you can see what to expect from the video below. A full description and feature list can be found on Portegno's site. We reviewed the music (re)discovery quiz Revinyl last year. We especially liked the philosophy behind the app and the multiplayer mode on the large iPad screen. Now, as promised, the new version, Revinyl 2.0, includes songs from the massive iTunes library, using previews on the store as the snippits you hear and have to identify in the quiz. Look for future updates to enrich the game play experience, including quiz review and sharing. Revinyl will also bring on shopping lists so that you can purchase the songs you discover in the quiz. A new music player is also in the works to add the visual analog touch to playing digital music. Revinyl 2.0 is still great fun and is available now in the app store for just $0.99 (59p) which is well worth it for a game with such a great philosophy and desing. What new iPad features will Apple be announcing next Wednesday? Who knows? But we think there are some great ideas here. Enjoy this (slightly overlong but funny) video parody. 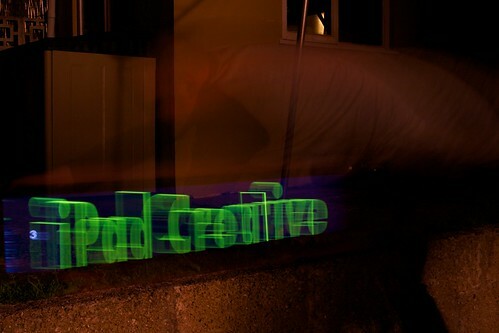 Light Painting with Holo-Paint - does it work? 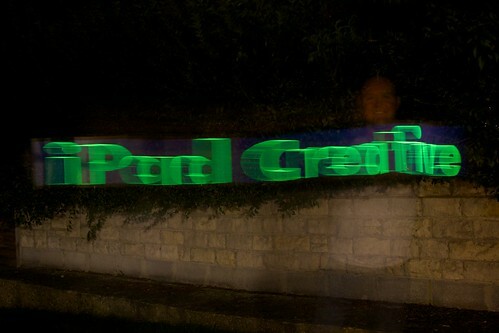 The iPad Creative team grabbed a rare opportunity of meeting up in the real world last night and what did we do? Yep, we played with the iPad! More specifically we looked at new Guitar FX app StompBox (more on that in a future post) and then, after annoying our wives and waking up the kids, we went out in the garden and played with the Holo-Paint app. If you don't know what Holo-Paint is, it is a light painting app that uses some clever stuff which, when combined with a camera capable of taking long (30 second or so) exposures, can create 'holographic' text that seems to float in mid-air, down stairs, along walls, over tables or anywhere else you can imagine. We posted about this app last week, and the developer has added a link to a tutorial video on YouTube (see below) and the new Flickr group for users to post their images created with the app, and there are already some interesting results there. We especially liked the musical notes floating above the piano. 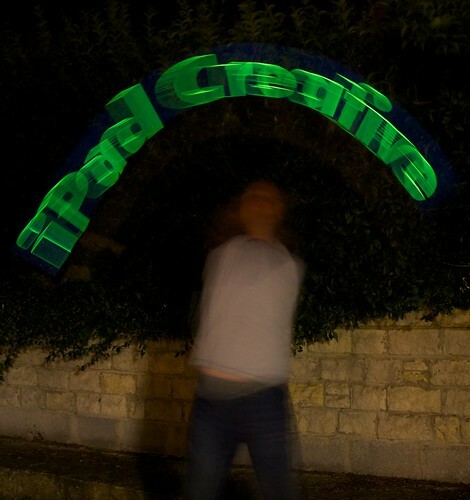 Although we didn't get anything like we saw in the Magic iPad light painting video, which obviously inspired the Holo-Paint app, we had a lot of fun trying this out and at the risk of being ostracised by the neighbours, we can't wait to try it again and get even better results. If you have an iPad (or even an iPhone) you can't go wrong spending $0.99 (59p) on this app. Try it out, it is great fun and we are sure you can come up with some imaginative results. Once you have your results leave us a comment and feel free to link to them, maybe even join the Flickr group, we can't wait to see what you can do with Holo-Paint. Time Geeks game. Get LOST on your iPad! This will brighten up your Monday morning, and cripple your productivity today! TimeGeeks is the new 'treasure hunt' type of game that is massive amounts of fun at a great price, just $0.99 (59p) in the app store. The game uses a zany aliens and time travel scenario (geek joy!) combined with cute Pixel Art graphics, funky electronic game music and clever references to TV shows like LOST and the IT Crowd (two of our favourite shows) to completely distract you from the main aim of the game, which is to find the items in the quickest time. There are also different game modes, seven minigames to unlock, integration with Apple's Game Center and you can even create your own Pixel Art scenario in the game and share it with others on Facebook. We like this game a lot, watch the trailer then go and get it at the app store now!